It’s never easy to say goodbye to a beloved family member. For many of us, the loss of a dear four-legged “kid” is as heart-wrenching as any human loss. You may wonder why I haven’t been authoring my blog for so long. Here is a large part of that reason. It’s incredibly hard for me to even think about this, let alone write about it; but I’ll give it a try. You’ve read about our Dolly girl in several previous posts. Without reprising all of that, I’ll give you a synopsis of how Dolly came to be with us. We really weren’t looking to adopt. We had Bear and Sydney who had established a relationship over almost three years of living together. Bear had driven poor Sydney (who was a senior when we adopted her) a little crazy with his youthful shenanigans, but they had reached a comfortable status quo. Bear was a couple of weeks shy of his first birthday when we adopted him and Syd was a senior, but it worked. 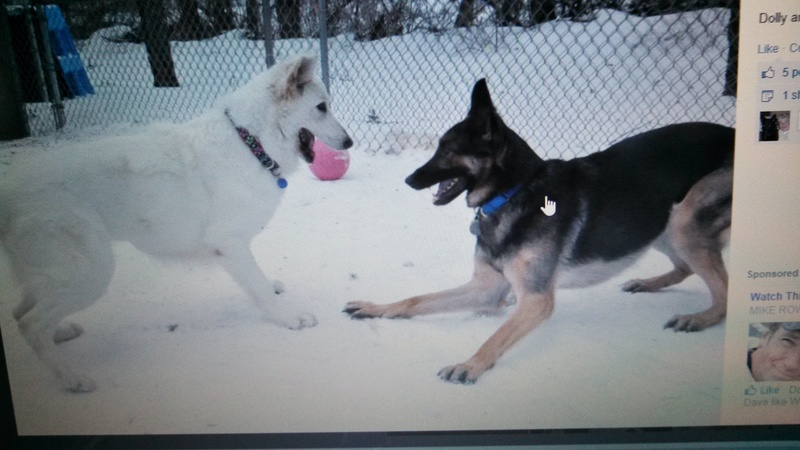 Sadly, though, Syd was slowing down quite a bit and Bear really needed someone to play with. Syd wasn’t a viable candidate for that anymore. One evening I was reading posts on Facebook, when up popped the photo of the most adorable, fluffy, white, German Shepherd Dog I’d ever seen. 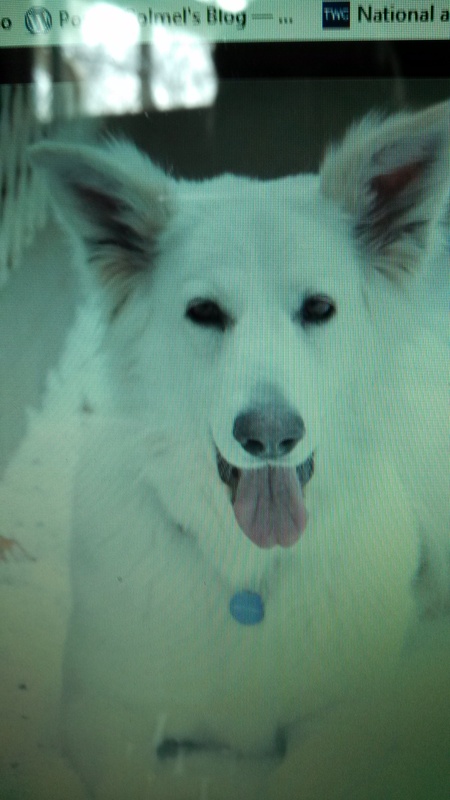 Jim had always said he would like to have a white GSD female sometime. Here was the cutest face on the planet and she was coming to Michigan. I knew in my heart that she absolutely must come live with us. She would be the white female Jim had wanted and the playmate Bear needed. I put the wheels in motion. I started writing to Southwest Michigan German Shepherd Rescue (the organization that she was coming to all the way from California). I went to their website and filled out all the paperwork. 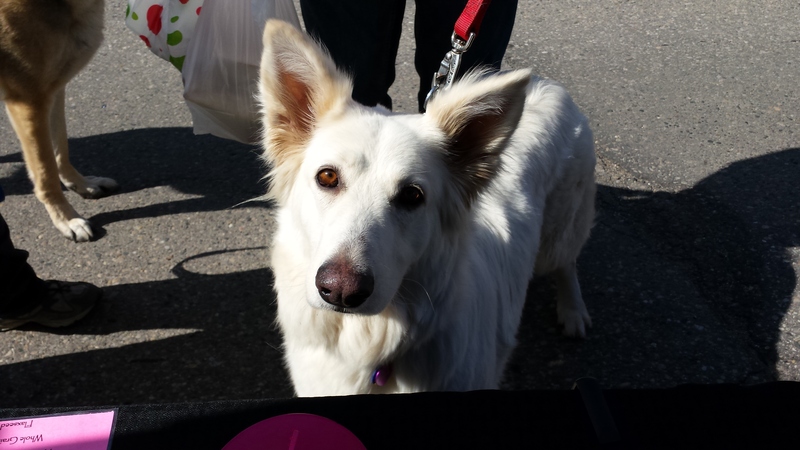 “Dolly” (as she had been named by the rescuers in California) had been pulled from a high-kill shelter by an organization called Miracle GSD Network. Dolly Pappas – Day One! After the Miracle Network checked over our application and followed-up with our references, we were approved to adopt Dolly. Sydney, Bear, Jim, and I piled into the car and drove to meet Dolly. Everyone got along beautifully, and Dolly became part of the family. Honestly, though, she was already firmly in my heart. 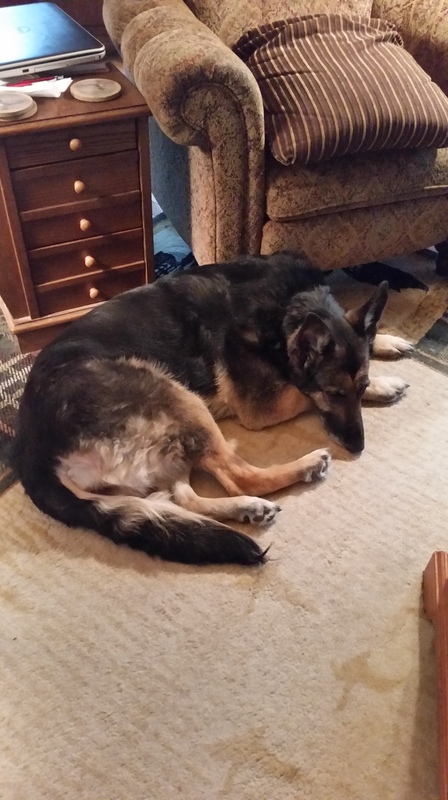 As you probably recall from previous posts, we adopted Cinder from Southwest Michigan German Shepherd Rescue in 2014. (See previous post “Cinder(ella? )” She had come to the rescue in exceedingly poor shape. She was nothing but skin and bone and her toenails hadn’t been trimmed in ages. Basically, she was a mess. Kristin at SWMGSR immediately went to work to get “Sinder” healthy. 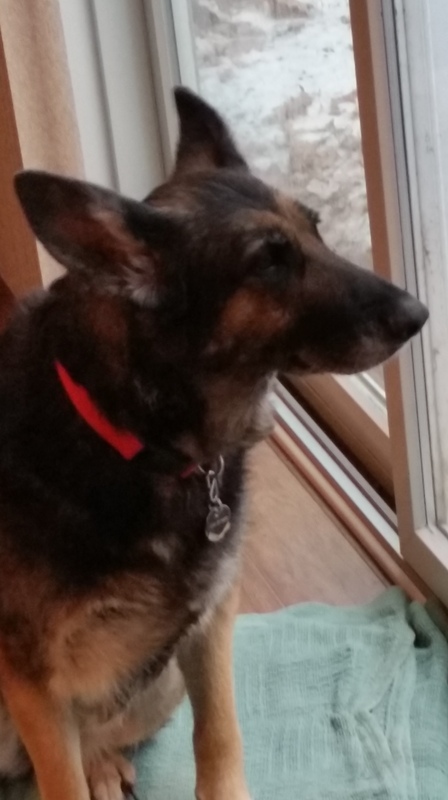 She called us as she knew we had experience with adopting seniors and had recently lost our most senior girl. Would we consider taking on another senior? After the requisite spaying (and – in this case – nail trim), we rode out to meet “Sinder” with our Dolly (who had been adopted in April of 2014) and Bear (adopted July of 2011). Everyone seemed to get along well, so we signed the paperwork and Cinder (immediately changed her name to match her coloration) came home with us. Sometime in the fall of 2015, we noticed that Dolly seemed to be “dragging” her front feet a little. She still would run, but she seemed to knuckle under frequently. Our vet thought it was possible that she had banged her shoulder into the dog door and was experiencing some weakness due to some minor nerve damage. He also cautioned, though, that we might be dealing with Wobblers’ Syndrome if she didn’t improve over a little time. My earlier blog posts went into great detail about Dolly’s challenges with Wobblers’ and her brave struggles. Life has a way of throwing hard, curve balls at you. How you respond to adversity sometimes tells you more about yourself than when things go well. Earlier this year, Cinder started a swift decline. Her mobility became very compromised. She had difficulty getting in and out of the house. Walking for her was exceedingly difficult. She was obviously in quite a bit of pain. She didn’t even want to eat. We tried everything the vets recommended, but Cinder was telling us she was done. With a great deal of sorrow, we allowed our big girl to end her pain and suffering and go to the Rainbow Bridge in peace. Only a month later, our Dolly dog started to experience very similar problems. Her Wobblers got to the point where she was unable to control any portion of her mobility or her internal organs. We tried helping her with a sling – which worked for a while. Within that short time, though, our Dolly gave up. She couldn’t be coaxed to eat anything. (Dolly had always been such a “chow hound.” Undoubtedly, this was due to her tough life on the streets of California before she was rescued.) She wouldn’t even try to rise. I still get a huge lump in my throat and my eyes tear uncontrollably when I remember the sad, pained look of surrender in her eyes. Once again, we had to make the decision to let her go. It’s never easy to lose a family member. To lose two in the space of a few short weeks is almost too much to withstand. Our poor boy, Bear, was very sad and confused; but we know that he had an even better sense of the degree of the girls’ conditions and illness than we did. Letting them go was the hardest thing to do, but it was also the ONLY thing to do. Allowing them to suffer was never an option. Cinder and Dolly will always have very special places in our hearts. We will miss them until the day comes that we join them again across the Rainbow Bridge. Remember, I really love to hear your comments. Just click on the “Leave a Reply” link and let me know what you think. Also, let me know if there’s something you’d like to hear more about. Looking Forward to “Seeing” You Here Next Time on Colmel’s Blog! 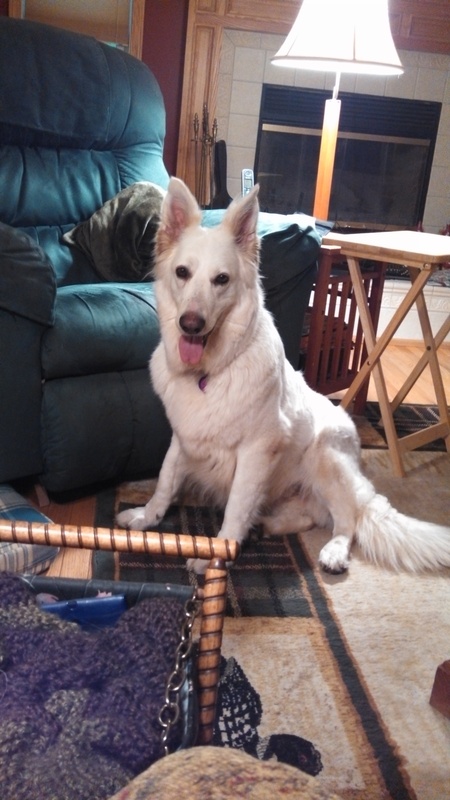 This amazing post was written by Tuesdi Woodworth, one of the founders of Miracle GSD Rescue. (Check them out on Facebook.) 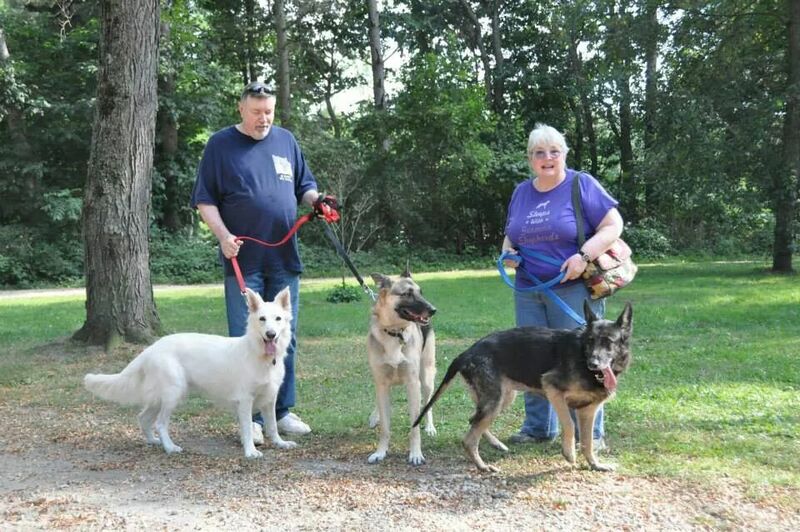 We have adopted two seniors in our over 20 years of welcoming rescued German Shepherd Dogs into our lives. We wouldn’t trade our time with Sydney or Cinder for anything! November is “Adopt a Senior” month. Almost all of the rescues that Miracle partners with have seniors in their programs. Wonderful seniors that are just…..WAITING for a home. And waiting. And waiting. They (and WE here at Miracle) would love to help more of them, but they cannot do it without more fosters and adopters! Everyone always wants the rescues to help the seniors and they get emails and messages by the dozen about it. But how can we save more when they can’t find them homes? When they know they will be there for months and months, because so many people pass them over because they want young dogs. It is just….WRONG. We have to somehow convince more people that adopting a senior is a wonderful thing! Your time with them will be extra special, even if it is a little shorter. How do we convince you? We thought by sharing the story of Miracle Dog #00 – King – might help! I am sorry that this is going to be long – this is something I am really passionate about it. Please, Please – take the time to read it! I hope that we can convince even ONE person to adopt/foster a senior. First – All of us at Miracle GSD are so grateful to the fantastic rescues that we work with! They all do their best to help senior dogs when they can, but they all have the same problem…convincing people to adopt them. People want puppies. People want “young” dogs. The Rescues can’t save nearly as many seniors as we would like them to. They simply don’t have space. Seniors tend to stay at the rescue longer, most of the time they can only have one or 2 in residence – as they could be there for months until adoption. That space would turn over multiple times in the same time period with younger dogs. So – they have to be careful. Their hands are tied. When a senior dog ends up in the shelter, it rips all of our hearts out. Yours, too! We all scream for help, and beg rescues to take them. SO – we ALL want these dogs safe, and we all agree they are SO deserving. If that is the case, then WHY aren’t we all ADOPTING OR FOSTERING THEM? Obviously, there are some valid reasons people cannot help a senior. Maybe they have a dog that is not dog friendly and can’t take another. Maybe they can’t afford some of the medical care that might be needed – mobility drugs or that sort of thing. Maybe they live in a home with lots of stairs just to get into it. And of course there are other good reasons. But do you know what we hear most of all as a reason? “I would take him if I could, but I just can’t do it because I would be too sad that they would leave me too quickly- I couldn’t take it.” Now THIS- this is NOT a valid reason. That comes from fear, and it is selfish. Harsh words, I know. But hey – I can remember saying them, myself a few years ago – so I get why someone uninformed might think that. (Boy was I uninformed, then!). Let me tell you my personal story. 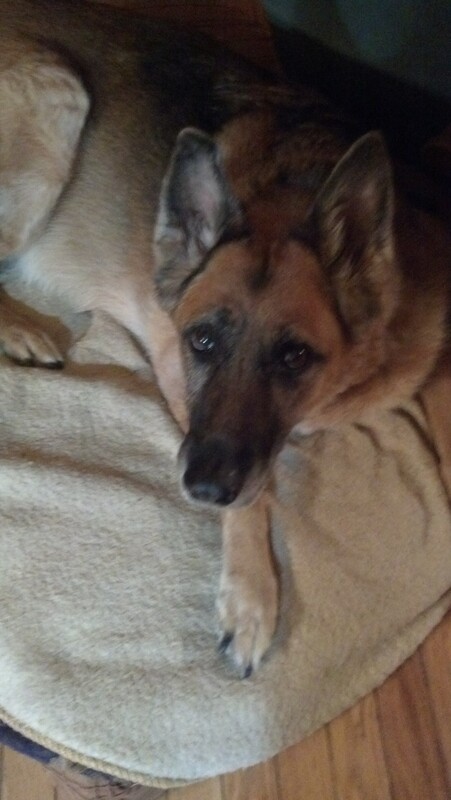 I’ve had German Shepherds, raised from pups, for over 25 yrs. Also rescued greyhounds for the same length of time. A few years ago, when our greyhound passed, we went back to the rescue to adopt another – they had several available under 2 years old. We had a GSD pup at the time, our second, and he was about 6 months old or so. Well – we got there, and they brought out the first girl to see us. OH MY, was she sweet and beautiful. She was a lovely golden color, and so soft and sweet. She slowly ambled up to us, gave us kisses, and went to lie on a bed, I loved her! They said “This is Tillie. She was adopted from us, and her owner died, so she has come back. She’s 8 years old.” MY HEART SANK. EIGHT? I said, umm we said we wanted a dog under 2. He said, Oh – I know. I just wanted you to see her because we really need to find her a home. We will go get another, younger one. He left Tillie there, looking at us, while he brought out the next one. She was adorable, too, and about 2 years old. Fearful, and tiny. Typical greyhound rescue that had just arrived from the track. We will take her, we said. But we kept looking over at Tillie. This beautiful, soulful girl. We just could NOT walk out without her. So we took both dogs. What a fantastic dog Tillie was! 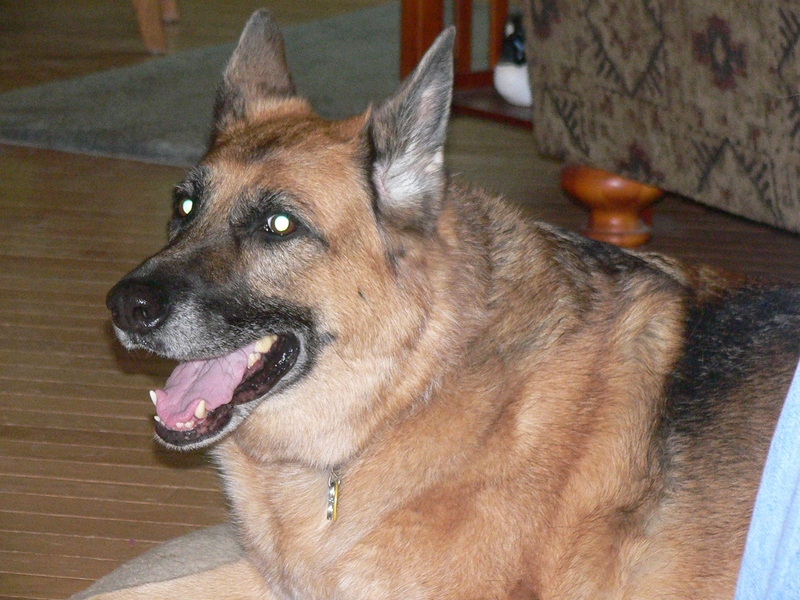 We NEVER even thought of her as a senior – she was just a quiet, fun loving presence in our home. She was with us about 3-4 years when she took ill, and we were unable to save her. How I cried when she went, but I knew we had given her a great life. We still had the GSD, now an adult, and the other grey. It never occurred to us that we had done anything special – and again we never thought about her being a senior. 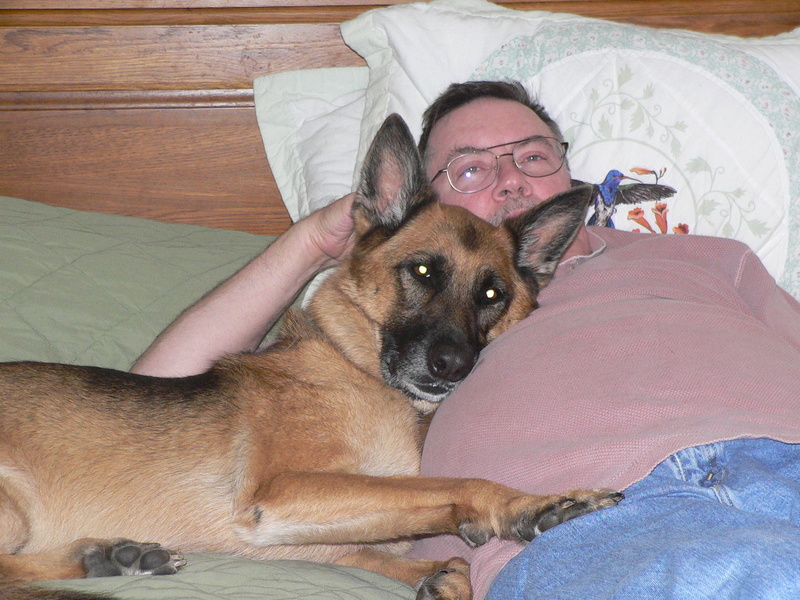 A few years later, my GSD Hobie contracted a fast spreading cancer. He was only 7 years old. The last GSD I had had from puppyhood had lived 14 years, and died of old age. I did everything medically that I could to prolong Hobie’s life, but he died at 7. The weeks before he died (and I knew the end was coming) we did a ton of stuff together, a bucket list of sorts, and the time was super special. I savored every minute because I knew he was not going to be there soon. It was awful when he passed. But I knew I had given him a great home. So I found myself dog-less. Ok for a few months while I grieved. During that time, I started to see more and more German Shepherds on Facebook popping up needing rescue, mostly in California. I had NO idea this was going on! I am in Maine – we don’t have thousands of dogs in shelters. And a GSD in a shelter would be very rare. I was blown away by what was happening around the country, which until then I hadn’t been aware of! And amongst all those dogs were seniors. Sweet, elderly, beautiful dogs betrayed. 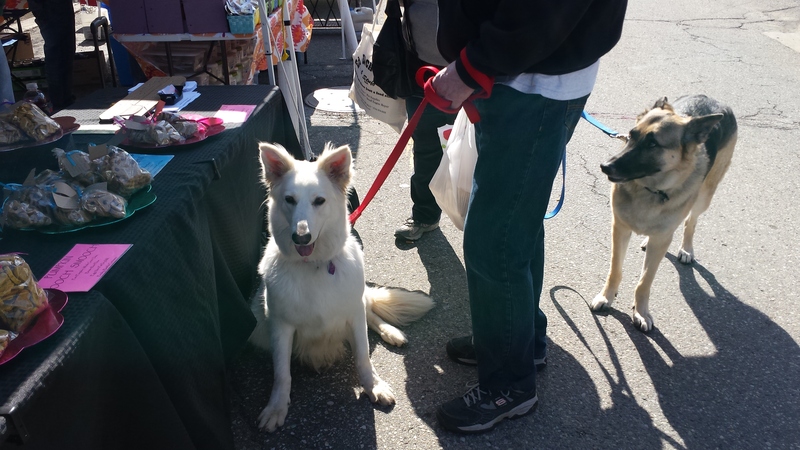 I had been planning on getting another GSD pup….but…..the more I saw these dogs, the more I thought – maybe I should help a senior dog. It might be easier – I wouldn’t have to housetrain a pup, run home from work to let them out…etc etc. The idea kept growing, and I kept seeing more and more of them. So I decided. I WOULD do it. I would save an OLDER dog that was on death row! 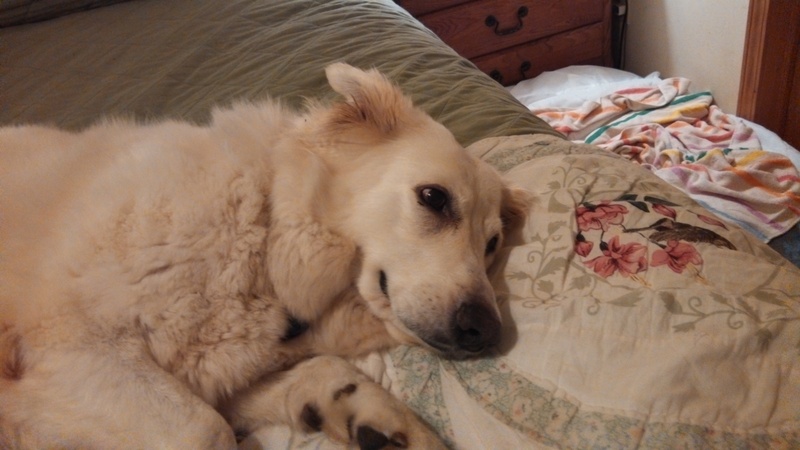 So I did – with help – save a senior dog that was euth listed from a shelter in CA. I won’t go into the mechanics of how that was done here to move the story along. I was so proud, and excited. I had to wait a couple of weeks for his transport, and I was telling everyone here at home about it, and they almost all were asking me “Why would you put yourself through this again! You lost Hobie just a few months ago, and this is an old dog! He won’t be around for long and you will be heartbroken again!” And I kept saying – I will be OK. I am doing a good thing for this dog. I am saving his life! I’d thought and thought about it. So – King arrived. The shelter estimate was 10 yrs old, I believe he was younger. 8 maybe. He seems to be around 12-13 now. He’s slowed down but he is still pretty active. I’ve had him longer than I thought I would. Can I tell you the JOY that this dog has brought me? He bonded to me the second he saw me. That very day. Don’t let anyone EVER tell you an older dog won’t bond with you. Don’t let anyone EVER convince you that you can’t train an older dog. I’ve checked adoption apps and done interviews for rescues and I have had people tell me that they don’t want an adult dog because of those very reasons. I’ve had them tell me that they want to have a young dog to grow up with their children. I DO understand this, I DO. But how about teaching your children some empathy, too, around this important issue. Imagine bringing a senior into your home, and teaching your kids the value of that – having them grow up with that kind of compassion for older animals? You know how I said when my Hobie was dying, I had a few weeks that were very special with him? We did bucket list sort of things, and the time was super special. With King – we live every day like that since the day he got to me. Because I don’t know how much time he has left, so from the day he arrived – our time has been special! That is how it is when you adopt a senior! And King is responsible for saving HUNDREDS of lives himself, because HE was the reason Miracle GSD Network was formed – his story brought our group together! He started it all! We call him Miracle Dog #00. Seniors give SO much, and you need to do SO LITTLE in return. Seniors are easy. They are grateful. They fit into most households and packs easily. DO NOT BE AFRAID! When I lost my first GSD at 14, I was devastated. My heart was broken. When I lost my second GSD at 7, I was devastated. My heart was broken. When I lose King, I will be devastated. My heart will be broken. BUT – THIS time will be a little different. There will be a SWEETNESS, too. He would have been dead 4 years ago, if I hadn’t rescued him. Didn’t he deserve those years? I know his last 4 years were better than the prior ones he had lived. And he would have died in a cold, unforgiving place after enduring the crappy life he had been served up – would that have been fair? Because he was old? NO – I gave him something, and he gave me – and the rescue community something. So THIS time – with the sadness will be the sweetness. Adopting a senior is a joyful experience, not a sad one – you will NEVER regret it. I promise. I would, and will, do it again with no hesitation, until there are no more abandoned seniors being euthanized in shelters. Adopt or foster a senior! From a shelter OR a rescue! If you adopt or foster a dog from a rescue then you are giving them space to save another – you are saving a beautiful life! Please consider it – you can make a wonderful difference in the life of an old dog! 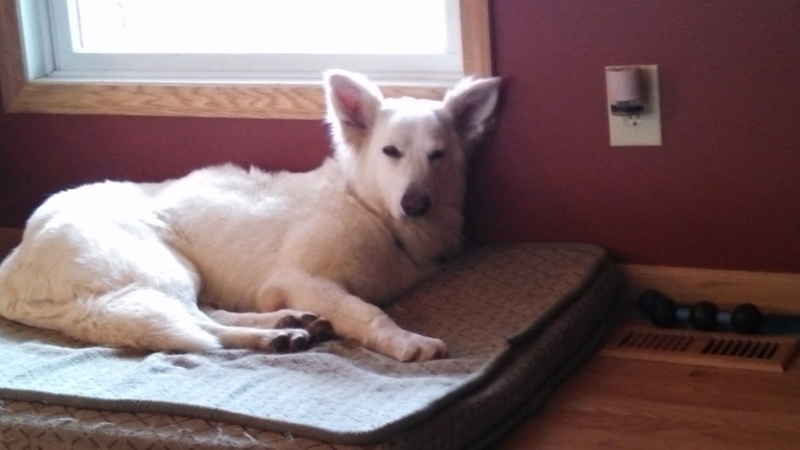 Those of y’all who have been following my blog for any time know that we adopted a beautiful, white German Shepherd mix in 2014 from Southwest Michigan German Shepherd Rescue. Dolly is a Miracle Dog (#307). If you haven’t seen a previous post, let me explain who the Miracle German Shepherd Network are. Miracle was started by a group of people who were incensed to find out how many German Shepherd Dogs (GSDs) were being euthanized in California shelters. They made a pledge that they would form a network of caring individuals who would get as many GSDs out of these high-kill shelters as possible and get them to legitimate rescue organizations across the country. Over the years, Miracle has grown to a network of many people who have taken these dogs into their rescues, been foster homes for the dogs, adopted the dogs, and/or been donors. The core group is still in place and responsible for keeping the lines of communication open and doing the “heavy lifting.” The Miracle GSD Network has a Facebook page where updates and happy stories about the Miracle Dog alumni. https://www.facebook.com/groups/310605105708097 . There are always more dogs to get out of high-kill shelters. I, for one, am so grateful that Miracle GSD Network exists. It’s thanks to them that we have our beautiful Dolly. About this time last year, we noticed that Dolly seemed to be dragging her right front foot. Not really dragging behind, more like knuckling under. It was the sound that caught our attention first. We took her to the vet who thought she might just have a stinger from blasting through the dog door. (She was really apt to fly through that like a shot.) He did, however, warn us that we might be looking at Wobbler Syndrome. We started her on a regimen of prednisone to see if it would clear up the problem. While it did help, short-term, the condition continued. We gave her a couple of months to see if perhaps her condition would improve over time. Actually, I think we were in denial and since she didn’t show any signs of pain, whatsoever, we had all kinds of blood tests and labs run. Fluffy Dolly – The Day We Brought Her Home! Finally, when her condition didn’t show any signs of improvement (although it had not gotten any worse), we asked our vet to refer us to a clinic where she could have an MRI. He agreed that this was the best course of action to see exactly what we were dealing with. It was a good decision. The clinic ran the MRI and did a spinal tap to rule out cancer. Thank Heavens, the spinal tap was negative for cancer, but the MRI showed “chronic intervertebral disc disease between C5 & 6 and C6 & 7.” This was pretty much what was feared. A surgical option was discussed, but there was no clear indication that surgery would improve Dolly’s condition, and there was a small chance it could worsen. We decided to opt for rehab. We are so blessed to know an incredible veterinarian who runs a rehabilitation clinic very close to where we live. Dr. Mary Cardeccia owns Animal Rehabilitation Facility in Dexter, Michigan. I had taken one of our previous dogs to Dr. Mary for acupuncture many years ago. Since that time, she has really increased the size and staff at ARF. They have everything one could ask for when it comes to rehabilitating pets. We took Dolly in for an initial evaluation. After reviewing the MRI, and the notes from the clinic, we decided to try a course of exercise, massage, cold laser, and hydro therapy for Dolly. After several months of following this course, we are starting to notice some small improvement. Dolly’s flexibility and strength seems to have improved and she runs almost as though there is no problem at all. She has developed some callousing on the top of her right foot (the one that seemed to be affected the most). Her right hind is reacting better than prior to the rehab. I must say that Dolly has come to really enjoy her therapy sessions. Of course, the fact that she’s completely fussed over doesn’t hurt and they have such terrific treats! I have to really rush to keep up with her when I get her out of the car at ARF because she’s so anxious to go see her friends (and stock up on yummies)! We all have to wear goggles (doggles in Dolly’s case) for the cold laser. I think she looks smashing in them. Don’t you? While most of the exercises are fun for Dolly, the water treadmill is not her favorite – at all! Poor little thing! She really doesn’t like it, but she’s a trooper. After finishing 8 sessions, we are moving on to just going for cold laser treatments. (No more water treadmill which will make her a pretty happy puppy!) As long as we see no regression, we will stick with the laser and slowly ween her off the prednisone. It’s very comforting, though, to know that the other options are still available should we not see continued improvement. Through all of this, Dolly has kept her sweet, loving disposition. 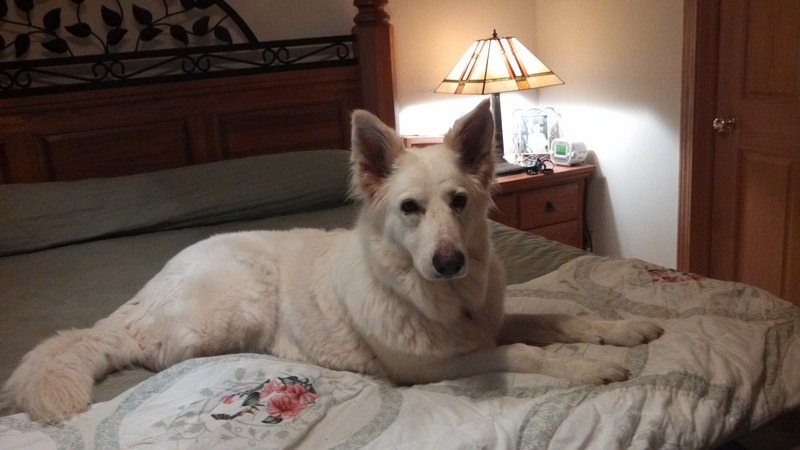 I’m not sure how; but I guess after having been picked up off the street in California and being put into a high-kill shelter, she knows that – thanks to the Miracle GSD Network – she’s in a home where she is loved and cared for. After all, Isn’t that what we all strive for? Be sure to check back. I will be posting about Dolly’s progress again in the near future. Those of you who have hung in with me over the years know that I usually try to interject some humor into my posts. This one is going to be just a little different. I want to talk, very seriously, about rescue. As most of you know, we have been very involved with both canine and equine rescues over the past years. This post is all about dogs. Blizzard, left tied to a tree without food or water when his “humans” skipped out on their rent. All of our dogs (who I refer to as my “furkids”) have come through rescues. We didn’t start out to go that route (our initial plan was to buy a puppy). Rather than deal in negativity, I want to tell you that we’re so very glad, now, that we have adopted all our “kids” through rescues. Cheyenne, the one who started it all! If you haven’t been with me for the long haul, let me tell you that a dear friend of mine was an officer with a rescue in Georgia when we lived there. She introduced the idea of adoption to me as a logical alternative to purchasing a puppy, as she knew that we both work and that we would, necessarily, be away from home for longer hours than was good for a puppy. She could not have been more correct. I’ve never once regretted adopting an adult (or mostly-adult) dog. Let me tell you a few of the great benefits of adoption. Rescue dogs are almost always past the “puppy” stage. “Puppy stage?” you ask. Yes, this is one of the first reasons we decided against buying a puppy. Puppies need to be raised very carefully. They need lots more constant attention than many feel able to give. Puppies need to be taught where they need to do their “business” and they need constant supervision and socialization to help them achieve their potential. Rescue dogs have (most often) lived with foster families who have learned the talents (and foibles) of each dog. They have learned how well housebroken (or not) a dog is. They’ve learned how each foster gets along with other dogs, often with children of differing ages, and frequently with cats. When you adopt from a rescue, you know – for the most part – who you are bringing into your family. Rescue dogs are already spayed/neutered. These are not inexpensive operations. For the girls, it’s a bit harder; but, for them all, it’s surgery. The rescues have already taken care of the medical bills associated with making sure your new “kid” won’t be having “kids” of his/her own. What this world does NOT need are more unplanned pups! 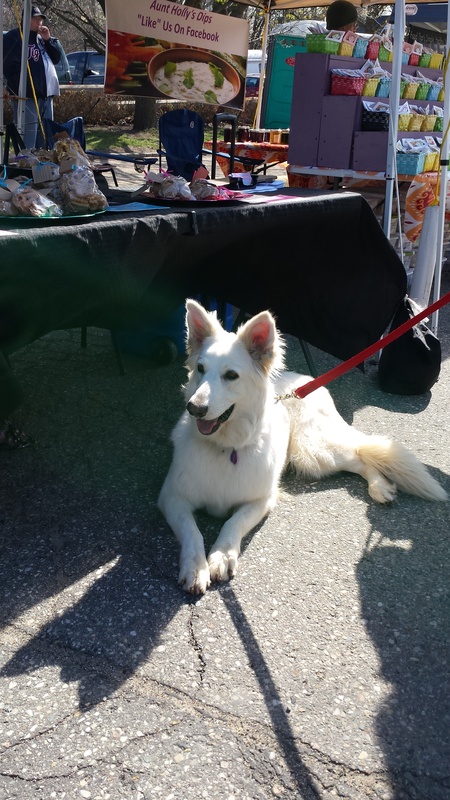 Rescue dogs already are current on inoculations, heartworm preventative, etc. Two of our dogs had been heartworm positive prior to reaching rescue. The rescue went to all the expense and spent all the time required (extensive hands-on care to make sure the dog doesn’t become too active while on the remedy) to cure them before they allowed them to be adopted. Rescue dogs are (again, for the most part) already microchipped. If you wonder whether or not this is a necessity, please go back and read my posts about Nitro – or read “Nitro’s Journey Home” page on Facebook. Microchipping can be the difference between losing your beloved dog forever and having him/her returned to you. Rescue dogs often have had at least rudimentary training. Once again, because they’ve been in a foster situation or spending lots of quality time with those involved with the rescue, most rescue dogs have, at least, some knowledge of how to act on leash. Many know other commands like “sit,” “stay,” and “come.” (“Stay” and “come” are extremely important for them to know whether they know it before or you teach them after they join your family.) Many have learned other fun tricks, as well. Rescue dogs have known rejection. They appreciate when they are brought into a loving home. They show their love (sometimes it might take a while to earn their trust, but they will learn) in more ways than you can ever imagine. A dog’s love – once earned – is unconditional. They will give every fiber of their beings to their family. There are so many stories about how dogs have saved their humans’ lives or protected them from harm. Think of the German Shepherd Dog in Alaska who got the attention of the State Trooper and forced him to follow him to his family’s burning home. Then there are also stories of rescued dogs alerting their families to carbon monoxide, fires, a child having a seizure, and so on. Rescuing a dog actually rescues three. The dog you bring into your family is one. The one who comes out of a possible high-kill shelter into the rescue is number two; and the dog that gets picked up off the dangerous streets is the third. Our beloved Sydney with Dad. This was the day we brought her home! I want to add that adopting senior dogs is one of the most rewarding things we’ve ever done. We have adopted two senior females over the years. 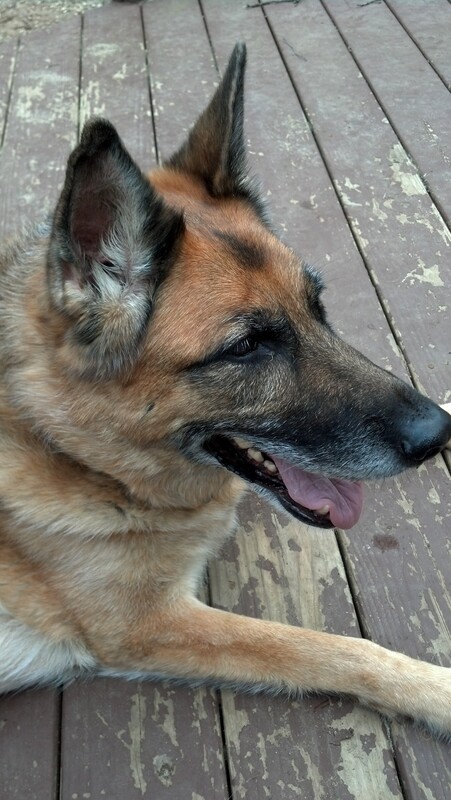 By senior, I mean over age 7 (in the case of German Shepherd Dogs – our breed of choice). Both girls had originally had loving homes, but human circumstances had changed their lives. One was caught up in a divisive divorce and, consequently, neglected by the one party she had to stay with. The other’s humans had developed health issues which negated their ability to properly care for their dogs. 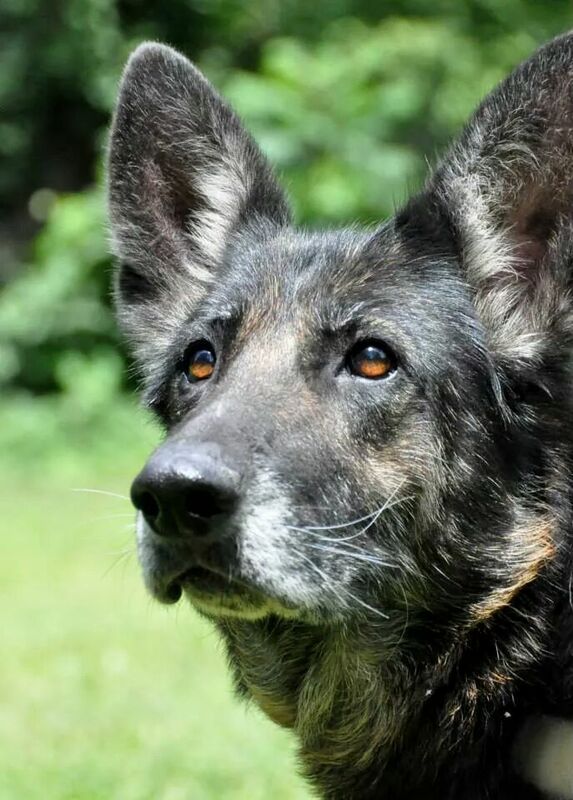 If you’ve read my recent stories about the Miracle GSD Network and, especially, The Thulani Program, you’ve seen what wonderful older dogs are out there. Granted, adopting a senior is not for everyone. It naturally follows that these dogs will not be with you for a very long time, but the time that you give them will often be the best of their lives. 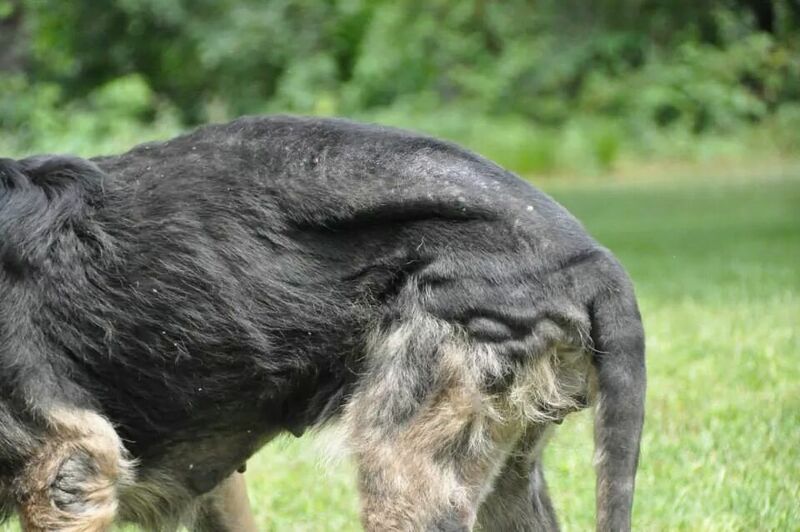 Giving care and love to an older dog comes back 100-fold. Guthrie T’s a Happy, HEALTHY boy with the Thulani Program Now! Let me finish this post with the one truism that encompasses everything I’ve talked about. I’ve said it, easily, 100 times. When it comes right down to it, I didn’t rescue my dogs – my dogs rescued me. They can do the same for you. You’ll see what I mean. After a long absence, I’m back. Work can put a real crimp on blogging, but I love my job and the people I work with, so I try to find a balance. In the transportation industry, things get really crazy for several months before Christmas, so work necessarily had to jump to the fore. I hope that I’m finally going to be able to get my blog rolling along again with new posts and updates to old stories. I hope you will hang in with me and follow along. I wrote about losing our sweet Sydney last August. What I haven’t written about is the message we got only a few weeks after she went to the Rainbow Bridge. 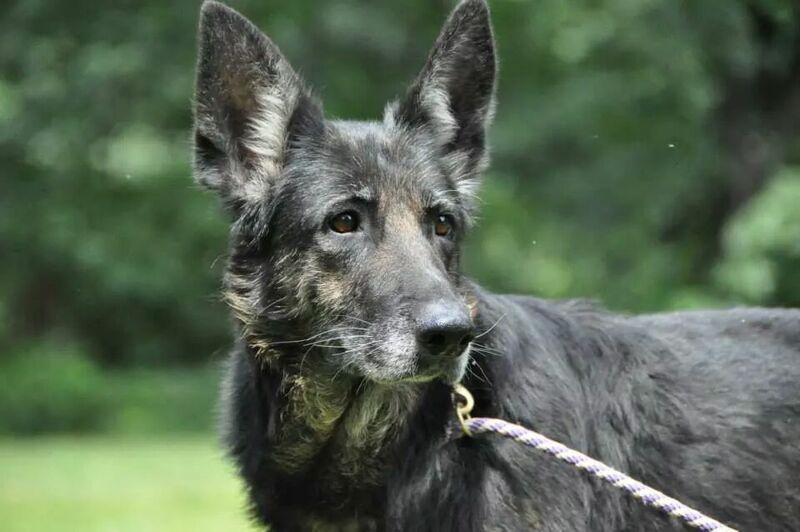 Kristin Bright from Southwest Michigan German Shepherd Rescue got in touch with me to tell me about a wonderful, older girl that had come to be with their rescue. This gal had come in with another dog – a male – from an owner who had some severe medical issues and was going to have to go into assisted living. Neither of his dogs could go with him. It was obvious from the photos, that “Sinder” had not had proper care for some time. She was painfully thin, had some severe flea dermatitis, had hard callouses on her legs, had virtually no fur on her tail, and her toenails were incredibly (grotesquely) long. I don’t believe it was from lack of concern, rather lack of ability to do anything. Kristin told us that she immediately thought of us as we had experience rescuing older dogs. She knew we were missing our Sidney and had room in our home and hearts for another dog. 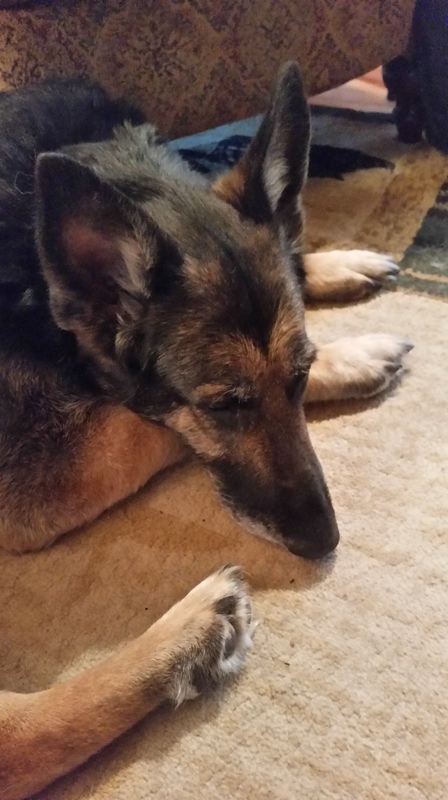 In case you’re relatively new to my blog, we had adopted eight previous German Shepherds – including Sydney – and fostered two others. 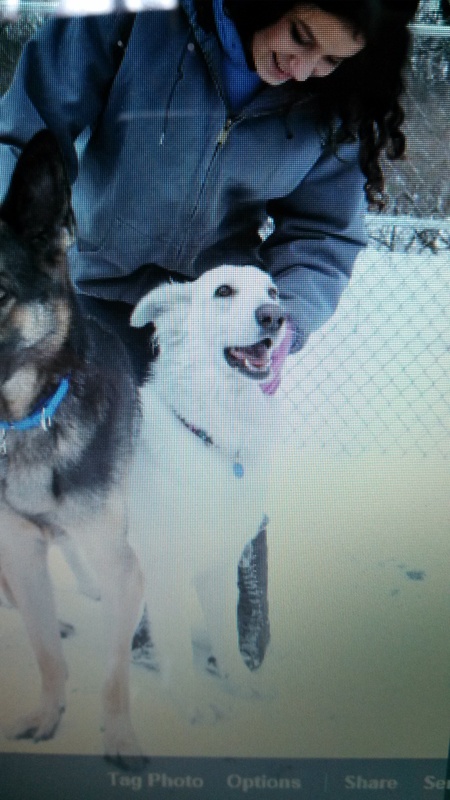 Kristin told us that this girl was a real sweetheart and needed a loving home to help her bloom and get back in shape. Maybe it was the nobility in her lovely face. Maybe it was the obvious need for a furever home. Maybe it was because we know how hard it is to place a dark-colored dog – especially an older one. Maybe it was just that both Jim and I hate the idea of a sweet, old dog not being with a loving family, but we immediately told Kristin that we would bring Bear and Dolly for a visit. If all went smoothly, we would adopt Sinder. Before we could visit, Kristin had Sinder spayed. (Yes, we’re pretty sure she had been used for breeding.) 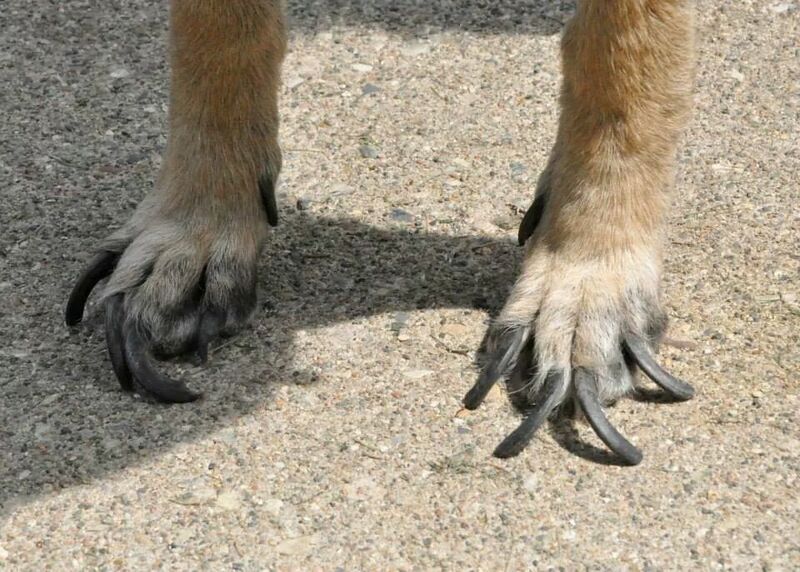 At that time, while she was under, the vet cut and cauterized her nails. They were so long and misshapen that they had to be done under anesthesia. She had several baths with medicine for her skin and coat. She was on her way back to health. Now Cinder is blossoming (Cinderella?). She gained the badly-needed weight. Her coat is shiny and full. Her tail looks like it should, and her dermatitis is long gone. 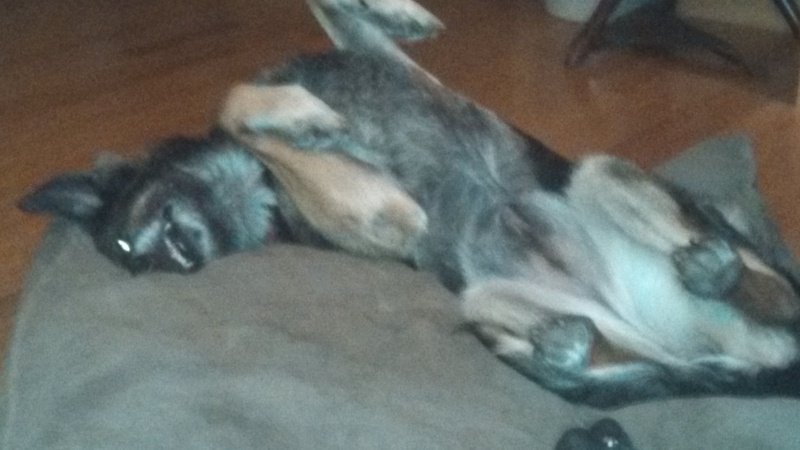 She’s a happy, quirky dog. I say quirky because she’s of the opinion that every toy that comes into the house belongs to her. It’s rather comic, and it’s a good thing both of the other kids are easy-going. I wonder if she ever had a toy prior to coming to live with us. She’s also not good with small dogs or cats. That doesn’t matter at all to us as we don’t have either. As it turns out, Kristin knew we would be a perfect fit. We wouldn’t have it any other way. Such a Pretty, Sweet Girl! 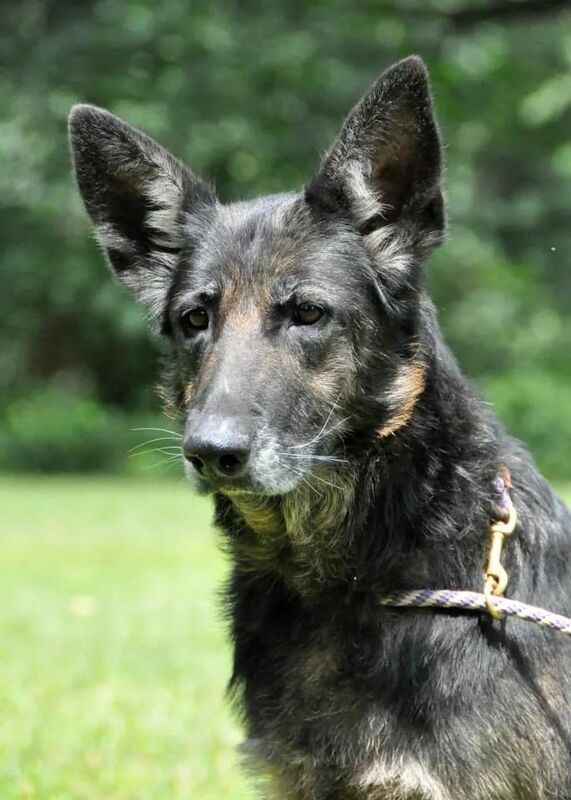 Below is the link to the Southwest Michigan German Shepherd Rescue. Please cut and paste it into your browser. Kristin does amazing things with very short funding and assistance. If you are in Michigan or close state and are considering adopting a new family member, you might want to see who is available. If you are considering making a financial donation to a tax-deductible charity, you might want to consider SWMGS Rescue. Looking forward to “seeing” you here on Colmel’s Blog! It’s high time to introduce our Dolly! Dolly is a California girl who was picked up as a stray by animal control. According to someone who saw them pick her up, she had been fed by an entire neighborhood, but no one had actually adopted her. Sadly, the shelters in California are way past capacity, and dogs and cats that are picked up rarely last past 4 days. By law, they have to keep an animal 3 days for an owner to look for them. If no owner in 3 days, the animals can possibly last for another day or two in case they are adopted. Then, well… you know what happens then. Luckily, the German Shepherd Dog community has reached out and there are several groups who routinely take dogs from California (and other state) shelters and send them to rescues around the country. 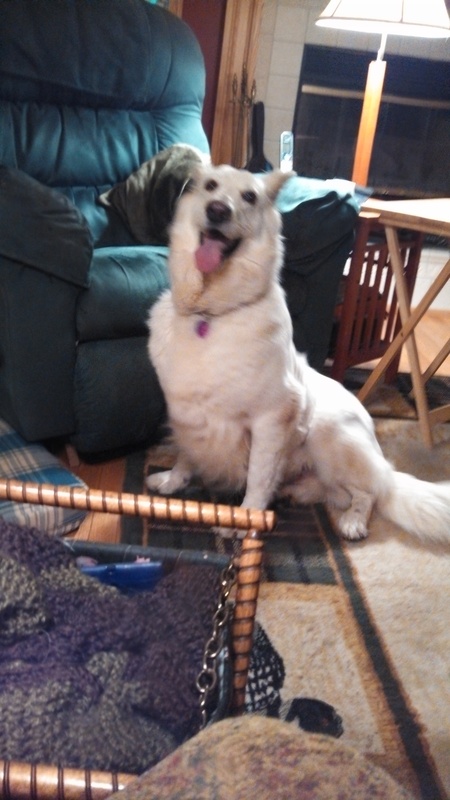 Dolly, thank God, was one of the lucky ones who got rescued and sent to Southwest Michigan German Shepherd Rescue. Once I showed her photo to Jim, it was a done deal – in our minds. Now, we just had to convince the rescue that we were the home for Dolly. I must say that SMGSR has a rigorous program in determining who is a good fit for their dogs. I was very happy to see this as it helps them to determine which humans are a good for their dogs; but it also helps the humans determine if the dog is a good fit for them. The first part is a questionnaire which I immediately filled out. I guess I probably was something of a pest, because I couldn’t just wait the 10 days they say – up front – it will minimally take to go over the questionnaires. 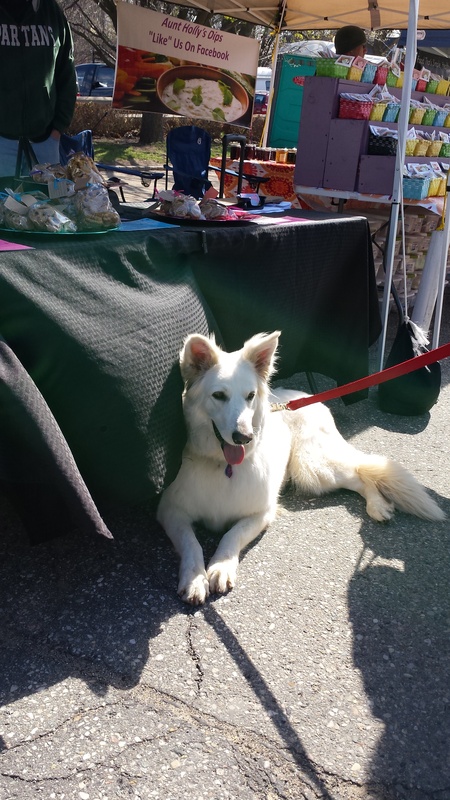 I called and left a message that I had filled out the questionnaire and that I wanted to reiterate that we are experienced with German Shepherd Dog rescues. At that point, we had adopted 7 German Shepherd Dogs since 1995. I wanted to be sure they knew that we really wanted to meet and hopefully adopt Dolly. Did I stop and wait there? Do you know me? Of course I didn’t. I called again just as the 10 day period ended and left another message about how much we wanted to bring Dolly into our family. At that point, I got a call back telling me that the director of the rescue was out of town, but that they could do the required telephone interview prior to that. I was overjoyed. We set up a time for that afternoon to complete the phone interview. I guess we must have passed muster with the questionnaire, vet interview, and telephone interview because I heard back from the director as soon as she got back into town. Kristin (who I now call a miracle worker because of all she is able to do with so little in terms of financing and also human help) called and asked if we’d like to bring our current “kids” Bear and Sydney to meet Dolly the next weekend to see how they meshed. Just LOOK at that Precious Little Dog! 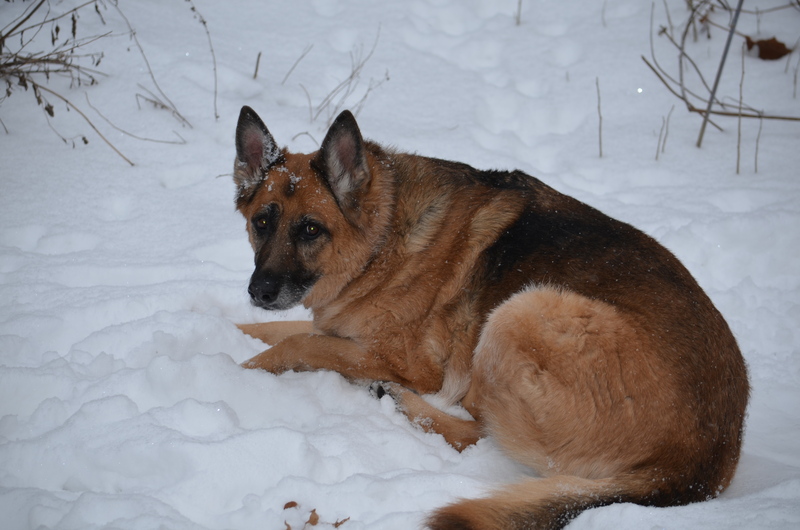 I was certain that Bear would be welcoming and friendly, but our Sydney (God rest her sweet soul) was an alpha female. I wasn’t so certain that she would appreciate a much younger, also female family member. The travel to the rescue (which is near Battle Creek, Michigan) went well. Sydney was having a good day and didn’t appear to be in any pain, so the ride was uneventful. Bear and Syd couldn’t figure out, though, why there was a crate in the back of the car. While we walked Syd and Bear around, the rescue got Dolly brushed and ready for her public. As soon as Kristin brought her out, I was determined that I wasn’t leaving without her. She was the absolute cutest, fluffiest, little (mostly) German Shepherd Dog I’d ever seen. Also, she was a wiggling mass of affection. It did take some work getting Sydney not to be put off by Dolly’s exuberance; but Dolly seemed to instinctively know not to push Syd’s alpha dog buttons. After an extended “getting to know you” walk around with Bear and Sydney and with only a minimum of posturing, Dolly officially became part of the family. Final paperwork was signed and we loaded our new girl into the crate. The other two spent most of the ride home sniffing the crate and trying to figure out exactly who this new dog was and where she fit in the scheme of things. (The following photos – for better or worse – are mine… WELL except for a few taken by the remarkable Paula TenBrink of Pawla’s Pantry (purveyor of the best puppy treats in the world). I must tell you that our Dolly has been a fabulous addition to our family. She seemed to immediately comprehend that Sydney was the “in charge” dog in the house. Right up until Sydney’s last days, Dolly was exceedingly sweet to her. The largest worry I’d had – that Sydney and Dolly wouldn’t like each other – never came to fruition. If anything, Syd looked after Dolly and vice versa. I’m so grateful that we didn’t let that concern dissuade us. Yes! I’m SURE I Heard “Cookie!” Pay No Attention to the Funny Dog with No Tail! Since bringing Dolly home to the family, we had her DNA run. 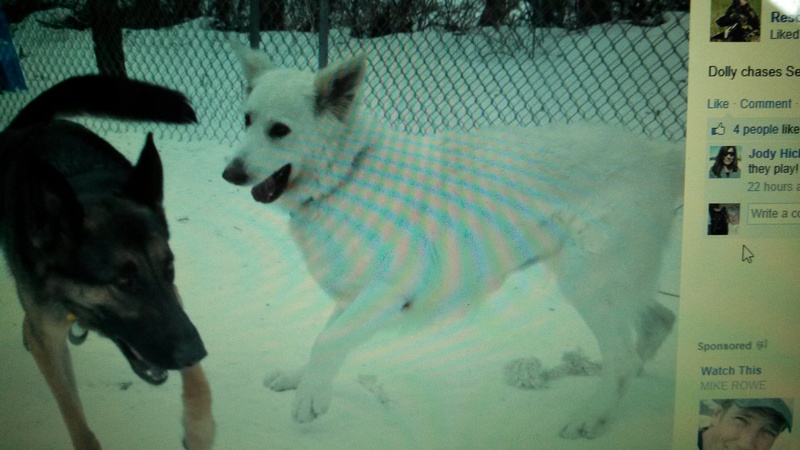 In a few of the photos you can tell that her body looks like a typical German Shepherd Dog, but her legs are really short, her paws are quite large and fluffy on the bottom, and her head and ears look like perhaps another breed. Something you can’t see from photos is the way she walks. She sashays! It’s almost like she’s hinged in the middle. We decided we just really wanted to know what parentage made for such a cute, yet incongruous, dog. 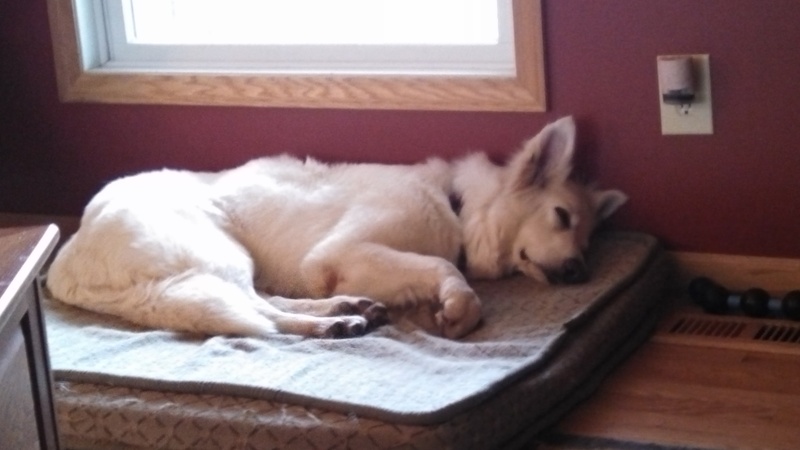 Turns out she’s a German Shepherd (White Swiss Shepherd), German Shepherd Dog, Cardigan Welsh Corgi, Keeshond mix (along with possible Chinook, Irish Setter, and/or Alaskan Malamute). Yes, Dolly does have some work to do. She’s wonderful with people – especially once she gets to know them. She’s vocal and loud with other dogs (rather like one of those annoying people who come right up into your face to talk to you – loudly), but she’s not really aggressive. Considering her past and life on the streets, it’s not at all surprising. We are working on her socialization skills and I’m certain that her sweet personality will dominate and allow her to be more comfortable around other dogs and in unusual situations. She’s an adorable work-in-progress that we’ll take great joy in helping along that path. Are You Done With the Camera YET? 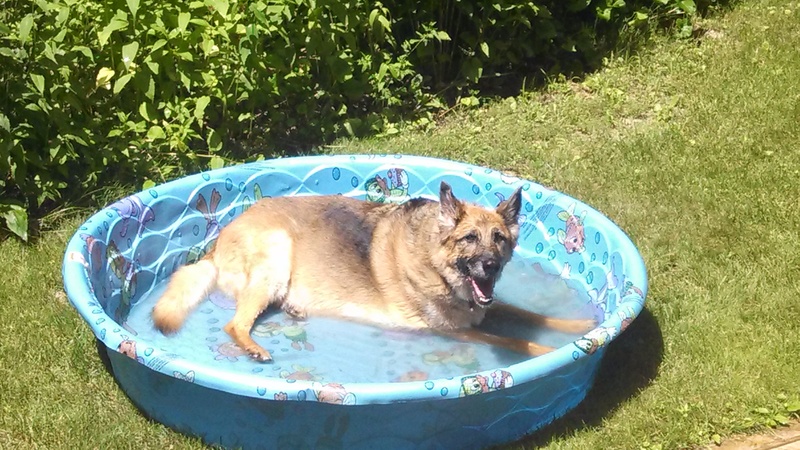 Below is the link to the Southwest Michigan German Shepherd Rescue. Kristin does amazing things with very short funding and assistance. If you are in Michigan or close state and are considering adopting a new family member, you might want to see who is available. If you are considering making a financial donation to a tax-deductible charity, you might want to consider SWMGS Rescue. Would you like to subscribe to my blog? (Oh, yes, it’s free!) Hopefully, you have already clicked on the title and are now directly in my blog page. If you have not gotten to the blog page, click on the title of the Posting and it will take you to the blog. From there, click on “Follow.” I hope you will. You will be notified of each new posting. I also hope you will jump in and comment on my posts. Before I get started, let me issue a tissue alert. This is not a happy post. As a matter of fact, I’ll probably cry all over my keyboard while I write this. I’m sharing this story because so many have to make the same decision that Jim and I had to make. It’s the hardest decision we humans ever have to make when it comes to our beloved “furkids.” We don’t come by this decision easily, and it’s one that we question over and over again. We do know, however, that when we finally do determine that euthanasia is the best and kindest answer for our pets, it’s been done advisedly and with the best interest of our family member in mind and heart. Sydney came to us by an unusual route – even for people who had adopted five previous “rescue” dogs. 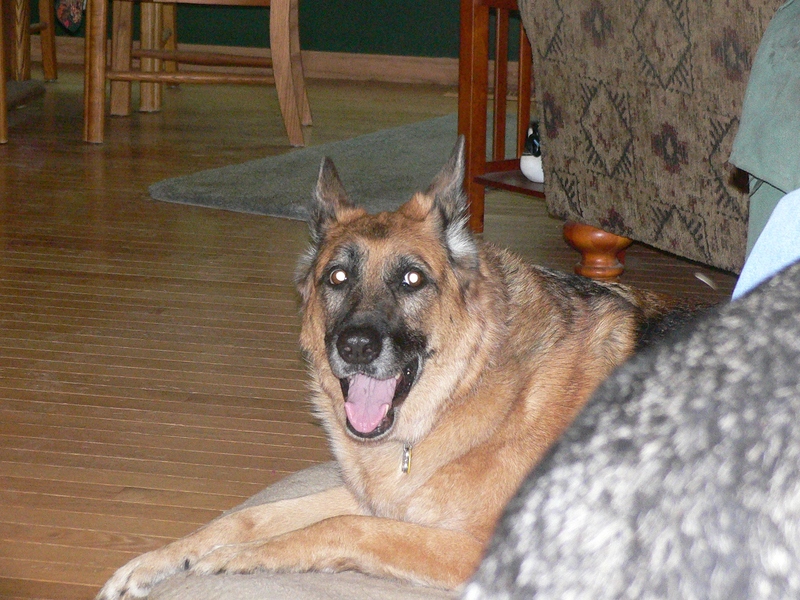 In August of 2010, our beautiful Liesel went to the Rainbow Bridge. She had lymphoma, and there was no hope for her. She’d become terribly sick and we just had to let her go. She and Jim had formed a very special bond. Anyone who has ever had pets in the family has probably had one who stood out as a “soul dog (or whatever species).” Liesel was Jim’s. I wrote an earlier post about Liesel leaving us. If you’re interested, it’s available in my back posts. Surprisingly, Jim said he wanted to go take a look and meet the dog. I called and made arrangements. This girl who needed a home was Sydney. The family had gotten her as a puppy, but the family dynamic had changed due to divorce. Sydney had been the husband’s dog. He had moved to a location where he couldn’t bring Sydney, and the ex-wife didn’t want her. It was either find a new home – and soon – or she would have been euthanized. You may have read this whole story in an earlier post, but I wanted to catch new readers up to speed on how Sydney came into our lives. It was very obvious – right from the start – that Sydney was to become a “daddy’s girl.” At first she basically tolerated me (although considering the lack of care she’d received from the previous female in her life, that wasn’t surprising). Thankfully, in the last year of her life, she came to love me, too. I’d never be as special to her as Jim, but she realized that I loved her and she let me into her heart, too. We had say goodbye to Sydney on July 7. Over the past year-and-a half, it had become increasingly difficult for her to walk on her hind end. 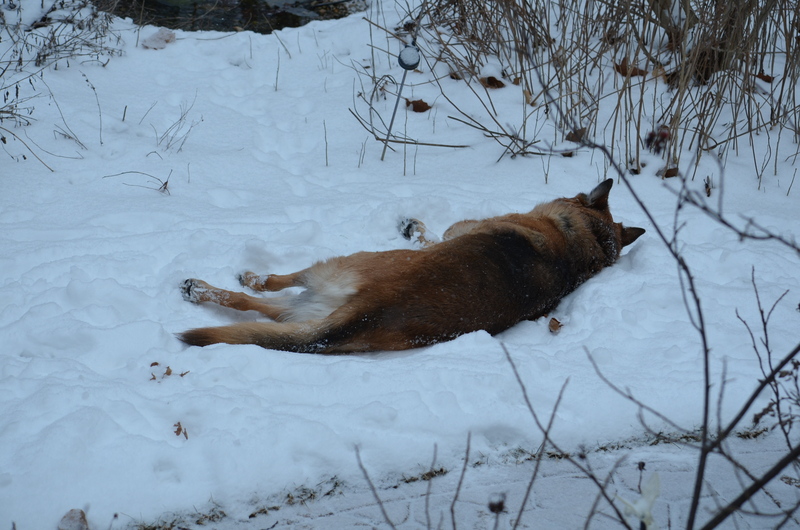 We had her tested for Degenerative Myelopathy (a common affliction that German Shepherd Dogs are susceptible to). The good news wasn’t DM, the bad news was that we couldn’t pinpoint what was causing the difficulty. X-rays indicated some extensive arthritis in her back, so we surmise that this was the main problem she was encountering. We managed to prolong her ability to get around by using prednisone, but that wasn’t a cure. Now, it’s time to heal. Everyone heals from the loss of a loved one differently. You may be surprised at how we choose to do that. You can read more about that in upcoming blogs. Until then, cherish those loved ones around you – be it human, canine, feline, equine or other. There are no promises of tomorrow.